Size match compared to an Arai? Yes, I have a pin head LOL! and wear a XS in both Arai Corsair V and the Pista. 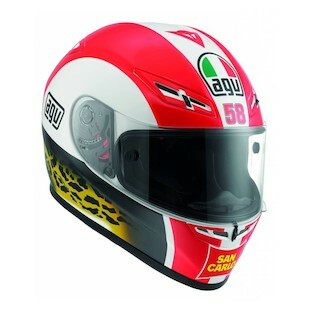 This one actually fits me better than the Arai but heads shapes are a million to one. Very cool looking... congrats! I think you should pm mark419ny the last pic so he can put it on his iphone home screen. Thanks and only $809.00 USD to my door! I'm not a Rossi fan club guy although I certainly admire his skills and personality. just got it today so wont have a ride report until this weekend. Blaze, congrats, super nice helmet. Is the sig on the chin bar on all of them or special to yours? Really nice. Last edited by oalvarez; Jun 6th 2013 at 07:12 PM. As Frosty mentioned. I gave my input on it. Had it for several months now. But if you have a jug head...forget it, it will create a hot spots for you. I'm confused...what's the difference between the Pista GP and the Corsa? They look the same, description is the same.